It may be spring, but parts of Vermont are seeing a dumping of snow, resulting in crashes across the state. State police said they responded to nearly 100 vehicle crashes and slide-offs statewide on Friday, including several multi-vehicle pileups. 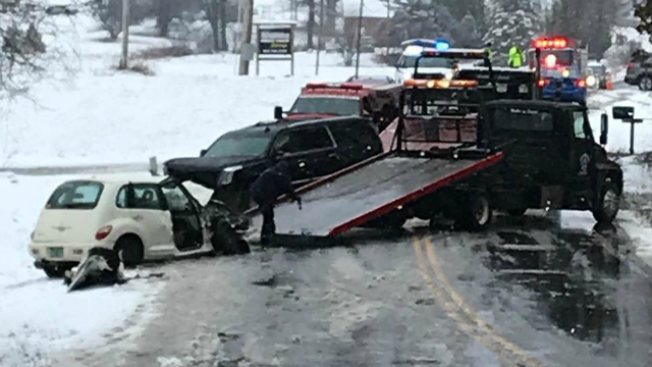 About a half dozen accidents resulted in injuries, including a fatal crash on Route 22A that remains under investigation. The southbound lane of Interstate 89 near exit 8 in Montpelier was "impassable" for a time due to multiple crashes. Several tractor-trailer crashes were reported across the state. The forecast is calling for 6 to 10 inches of snow along the western slope of the Green Mountains and parts of northeastern Vermont and more in the higher elevation. Winter storm warnings have been issued through Saturday morning for much of northern New England. The National Weather Service says driving could be difficult during the morning and evening commutes on Friday. It also says high winds on Friday night could lead to tree damage and isolated power outages. Green Mountain Power is also warning about possible power outages from the heavy, wet snow.